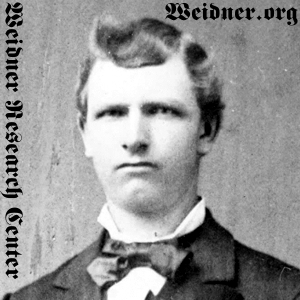 John Baptiste Weidner. Courtesy of Raupp Memorial Museum, Buffalo Grove, Illinois. [S11] John J. Weidner, Compiled Birth, Death, 453, 625, 627, 643, 689. [S31] Cook County Herald, 15 May 1908, p. 1, col. 4. [S875] John B. Weidner, State of Illinois; Department of Public Health - Division of Vital Statistics; Standard Certificate of Death. [S25] Enterprise Register, 19 Sep 1903, p. 4, col. 5. [S11] John J. Weidner, Compiled Birth, Death, 627, birth year only; birth date extrapolated from age at time of death 62 yearsr, 9 months, 3 days - 16 Feb 1860. [S405] The Cemetery Committee, Vernon Township Cemetery Inscriptions, Lake County, Illinois, 113, headstone states he was born 12 Feb 1860. [S425] Agnes Weidner, State of Illinois; Department of Public Health - Division of Vital Statistics; Certificate of Death, Death city, state. [S535] 05 Jul 1860 1860 U. S. Census, Arlington Heights, Cook County, Illinois, USA, Wheeling Township, page 151, dwelling 1061, family 1022, 1860 census states he is 1 year old and born in Illinois. [S875] John B. Weidner, State of Illinois; Department of Public Health - Division of Vital Statistics; Standard Certificate of Death, Birth date and state; states he is 62 years, 9 months, 8 days. [S875] John B. Weidner, State of Illinois; Department of Public Health - Division of Vital Statistics; Standard Certificate of Death, Buffalo Grove is sratched out with a line. [S405] The Cemetery Committee, Vernon Township Cemetery Inscriptions, Lake County, Illinois, 113, cemetery name, township, county, state. [S875] John B. Weidner, State of Illinois; Department of Public Health - Division of Vital Statistics; Standard Certificate of Death, Burial date, city, state. [S7] St. Mary Catholic Church, St. Mary's School Dedication, 144, 152, listed as deceased. [S7] St. Mary Catholic Church, St. Mary's School Dedication, 144 listed as deceased on this page only, 154. [S24] Enterprise Register, 25 Jul 1903, p. 4, col. 5.